Car rental agencies can charge a fortune, which often means we end up hiring the very cheapest two-door, micro machine they have to offer – not exactly what you want for a relaxing holiday or a business trip! Fight back with these easy to follow tips to blag a deal and save pounds from your car rental costs. Car rental companies will tirelessly try to flog you insurance. Most commonly renters roll up to collect their car to find that the insurance they paid for on booking is incredibly limited in what it covers (theft but not scratch damage, fire damage but not theft, etc) or that the excess is so large the insurance if hardly worth the money! At this point rental companies try to sell an increased insurance package for another fee and if they hook you with this, may also offer a selection of other health, luggage and late arrival packages too. In most cases, the best advice and the best way to cut costs is to leave insurance out altogether. Many drivers are actually covered to drive rental cars as part of their own car insurance policy, which makes rental car insurance completely worthless! Discount insurance companies have also started offering hire car deals for nominal amounts online, so if you do need to insure yourself, get it sorted before you pick up your rental. Otherwise, prepare to be rinsed! Blag a Car Rental Discount Online! If a car rental company overbook themselves they will have no option but to offer you a free upgrade. Call car rental companies at your destination (airport, train station, major city, etc) and find out if any of them are so booked up that they will be unable to provide you with the cheapest hire car for your selected dates. If you find a company this booked up, quickly go to their website and book the cheapest hire car option for your destination. It is important to do this online. If you try to book the cheapest option over the phone, staff will simply be unable to process the request. The rental website however, won’t recognise that the company hasn’t got enough cars. When you turn up to collect your vehicle, staff will be forced to give you an upgrade free of charge! Some online cashback websites offer customers money for renting a car through their website. 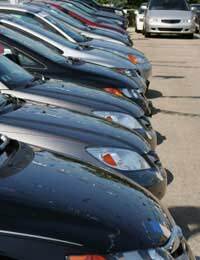 Car rental agencies pay intermediaries a commission for passing them new business. Cashback websites pass most (and sometimes all) of this commission on to the customer, which means that overall, your car rental will cost a bit less. For a more straightforward blag, try booking your vehicle a few weeks in advance. Some companies offer discounts to customers who book early. A simple way to save money! Blag a Car Rental Deal! Check with your credit card company before booking a hire car. Many credit card companies and some banks have permanent deals with large rental firms. Sometimes all you need to do is call your credit card company to arrange the hire (and discount) for you. Other companies may provide you with a discount code over the phone or by email. Incentive reward schemes offer customers discounts on car rental. To get this you may need to cash-in your accumulated points in store, or call a special rewards helpline. The best thing to do is to contact your reward scheme operator directly and ask them to help you get a discount. Students are often the luckiest blaggers of all. Sometimes, all they need to do is get out their student card to get instant money off! All students should ask about potential discounts when hiring a car anywhere in the world. Finally, all good blaggers should know that as a last resort, asking for a discount does sometimes work. During peak season when most hire companies are very busy you may struggle to organise this but at other times of year, particularly during the school term and mid-week, something can usually be arranged. If possible, speak to someone in a managerial position and mention that other car rental companies are charging less compared.